A number of earthen dams have been built near the headwaters of several creeks in the Piedmont National Wildlife Refuge and the Oconee National Forest to the east. 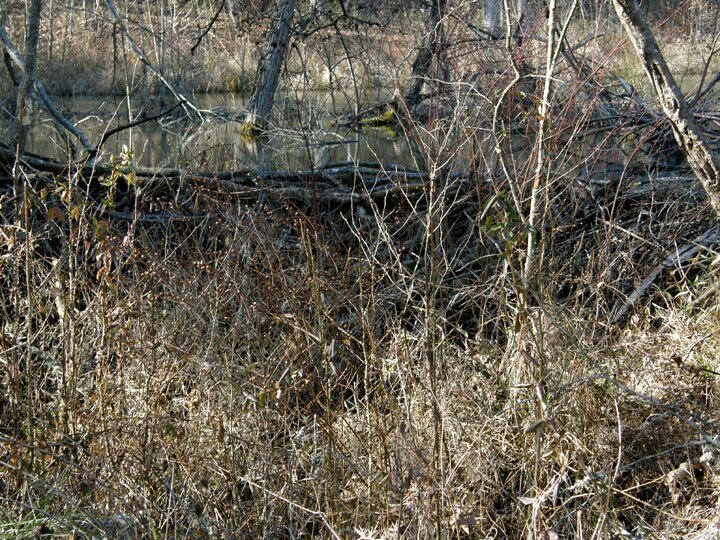 Occasionally, we’ll see beaver dams on creeks that create swamps above them. 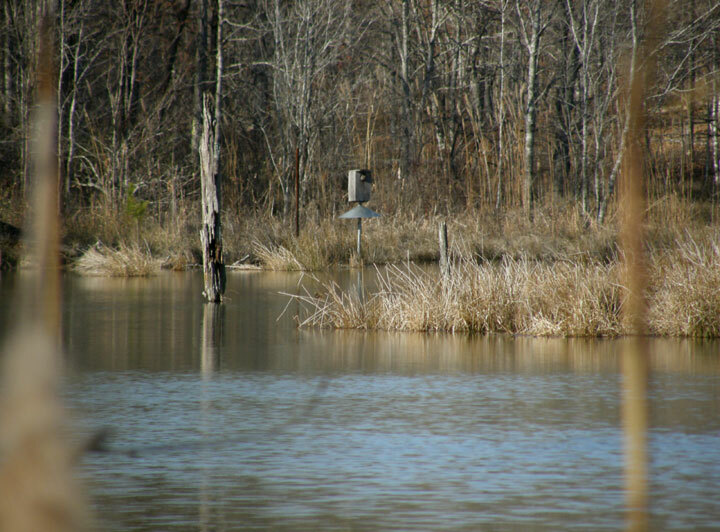 Usually, these beaver dams are only a foot or two high. We came around a corner where the road dropped down to cross a creek in the Stalking Head Creek area in the Oconee National Forest. Off to the north was a pond as big as the ones in the Piedmont NWR. It was a pretty pond. And it was a well-established pond. 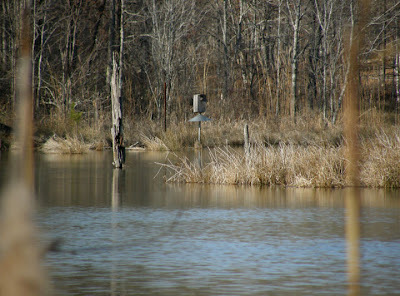 Duck nesting boxes had been placed at several locations around the pond. They’d obviously been there for some time. 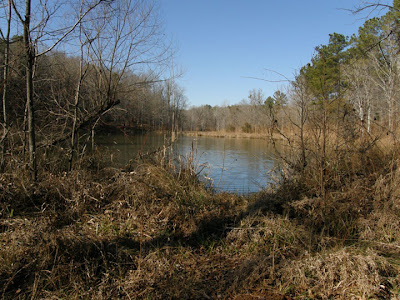 The dam on this pond was at least four feet high. As we dropped down to cross the creek the top of the dam was at eye level. We had to stretch our necks to see over it. 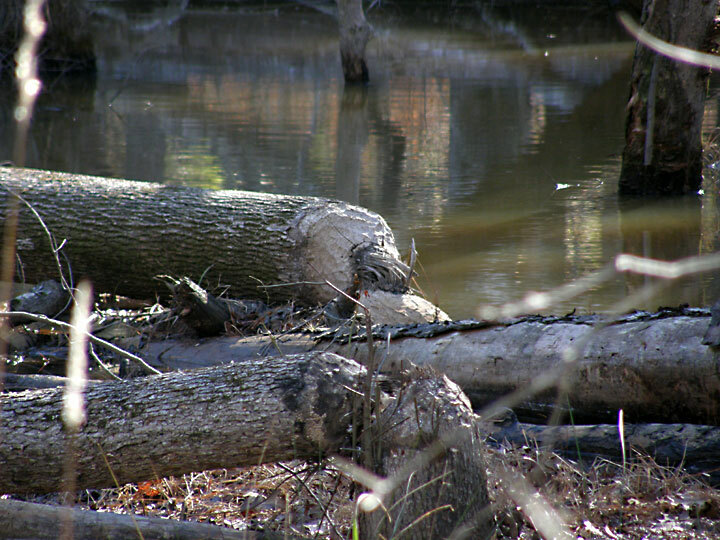 But it wasn’t an earthen dam; it was a beaver dam. 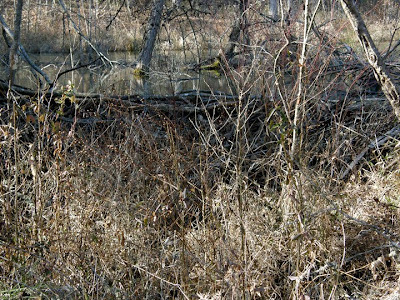 This one was quite impressive - on of the tallest beaver dams I've seen. A closer look at the dam. The branches were only 1-1/2 to 2 inches in diameter. In some places, beaver dams are considered to be a nuisance. The pond created by this dam had obviously been accepted and embraced by the local human inhabitants. 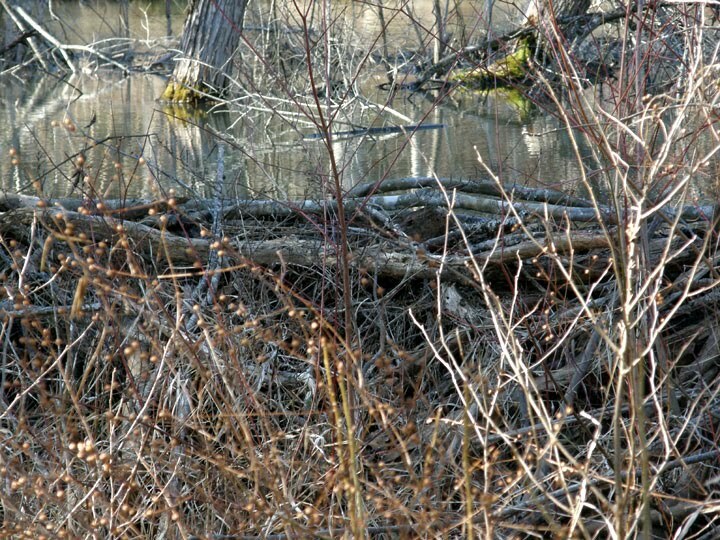 Downstream, immediately below the road crossing, there was more evidence of beaver activity. When I took this photograph, I had seen only the tree in the center of the photo that had been felled at least a year ago. When I processed the photo, I saw the second tree, in front of the first tree I had seen; this second tree had been felled at least a year earlier than the first tree. These trees were at least one foot in diameter. We didn’t expect to see beaver; that would be been a real bonus. Although I’ve seen beavers at Fort Yargo State Park in the middle of the morning and late afternoon, I’ve usually only seen them swimming in the lake in the very early morning. So it wasn’t at all surprising that we didn’t see a suspect. I understand the inconvenience of beavers. They do cause a lot of destruction but in the long run are beneficial to our environment. that is hard to see when then their work has flooded a corn field. Education of farmers and community members is important. I've only seen their dams in uninhabited areas. I can appreciate that farmers who lose crops do feel quite differently though. I would love to see a "beaver-enhanced" area, but the toothy critters aren't common around here. Your pictures of the dam and resulting pond are some of the best I've run across. Thanks Joy. This is probably the only real pond I've ever seen with a beaver-built dam. 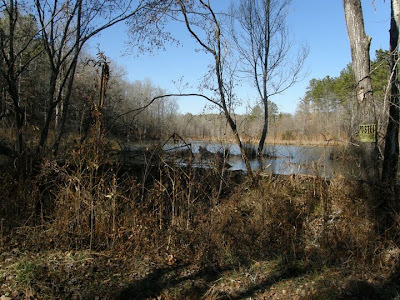 Most of the beaver dams I've seen are only a foot or two high and create a swamp rather than a pond. This was a real find.